In the quiet of Christmas morning, I left Austin, Texas, heading west along pencil straight Route 290. Passing silent cattle ranches, where Black Angus stood ghostly in their stillness and stance, waiting for sun to erase the night’s cool mist. Out into chalky hill country with wineries lining the two lane highway. Kuhlman Cellars, Hye Meadow Winery, Becker Vineyards. Each one unique, yet similar in their brittle rows and winter bare. Each waiting for spring and the promise of a new vintage. At Fort Stockton, Route 385 plunges due south and the terrain begins to shift. Chalkiness takes on a brownish hue and the land begins to rise in distant pockets. The scale of the landscape becomes difficult to measure, as mile after mile of Chihuahuan Desert sprawls on either side. Bumps, once in the distance, suddenly become thousand foot plateaus. Flat topped as if modeled in clay and finished with a smooth stroke from the artist’s hand, they spring from the earth and dominate the periphery. Driven by unseen forces over millions of years, the panting land swells and undulates as ridges rise and fall. Mountains appear to sink into the ground only to burst upward again. Great humpbacked serpents, moving along the desert floor. Funneling me into Panther Junction, the Chisos Mountains and the twisting Rio Grande below. The sun hitting rock turning it to gold. After descending 2,000 feet from Panther Junction, the three mile gravel road into Boquillas Canyon meanders in all directions. Captive to the surrounding terrain, it bottoms out and rises, before ending above a steep drop to the Rio Grande River below and the Sierra Del Carmen above. As I stood looking at the limestone layered face of the canyon, I was startled by what I thought was a grunting sound behind me, over the edge of the bluff leading down to the river. Warning signs for javelinas, wild boar-like animals with long jaw protruding teeth, are scattered throughout the park. Naturally, I did what any sane person would do, I raised my camera. If I’m going to be attacked by a wild animal I should at least get a photo, so they can see what left me limbless. Again the noise. I move slowly to the edge and looked down at the river. To my surprise, across the river, I see a young shoeless boy on horseback with a rope tied around the horn of his saddle. He is dragging a canoe out of the Rio Grande and up onto the steep rocky shore. Each time his horse moved forward, the canoe scraped the rocks and made a deep sound that carried on the water. I stood alone and watched him struggle up a dirt worn path and disappear into the pinon pines of Mexico. Sierra Del Carmen from a distance of approximately 20 miles. Not until you stand directly in front of these canyon walls can you appreciate their sheer scale. Same logic applies to looking at my head. The magnificent cliff walls of the Sierra Del Carmen in Mexico at dusk. 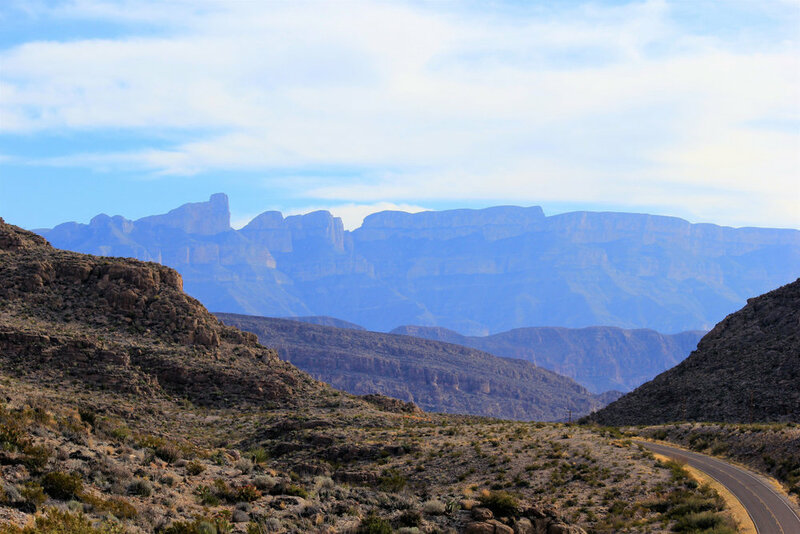 Big Bend is a land of extreme landscapes. Author Fredrick Gelbach beautifully describes these borderlands as “a carpet of interacting plants and animals deftly woven on a geologic loom.” Thorns below, ascending to evergreen, oak and aspen above. A dry hot, seemingly foreboding desert, surrounded by the diversity of high cool peaks and a river caressing it all. It is a harsh, tender union that began millions of years ago when the sea covered the land. Today, the diversity of plant and animal life is staggering and a study in contrasts. Roadrunners dart across roads and disappear into yellow grass. Coyotes roam the desert floor looking for prey. Plants that have adapted to their dry surroundings flourish. Bluebonnets, yucca blossoms. All perfectly choreographed by the architect of the desert, water. Who’s presence or absence determines the course of all life in the park. It is precisely these extreme cycles of wet and dry, that make Big Bend the vibrant ecosystem it is today. Voted best looking cactus in the park three years running, Rhonda has taken on a certain form of vanity. Insists on being referred to as temperamental instead of prickly. Rio Grande Village Campgrounds sits in a large grove of cottonwoods at 1,850 feet. From here the drive northwest to Hot Springs Road is only a few miles. As I turn onto the uneven gravel road, I am met with a sign announcing that vehicles over 20 feet, due to the curving nature of the road, should not attempt to drive the several miles back into Hot Springs. Oh, this sounds fun. And it was. Curves so sharp I could see my rear end in my rear view. Drops so precipitous and close, I had that standing on the roof of a building without a railing feeling. I put all the windows down, letting the dust from the road hit my face as I leaned out to see below. When I arrived at the small parking area, there were four other vehicles. Not an RV in sight. I grabbed my backpack and started walking to the spring. The one mile hike passes remnants of an old homestead and resort. Indian pictographs drawn high on overhanging cliffs and fields of bamboo, seemingly so in-congruent with the dry desert surroundings. Then you hear the sound of rushing water. As you step into a clearing on a hard-packed dirt shore, the clear hot spring lies nestled into the bank of the green tinged Rio Grande. Stone walls separate the warm spring from the cold churning waters. A stone’s throw away lies another country. Two young people – Zach and Courtney – sit on the stone ledge, backs to the river. I introduce myself – Hi my name is Jeff Bridges – and we strike up a conversation. As we are discussing Zach’s leaving a Wisconsin newspaper to work at Big Bend and Courtney saying she wants to contribute to my blog, a large smiling gentleman in striped bathing shorts approaches. “Vill you take picture?” he asks Courtney in broken English. “Of course.” He wades into the warm water and begins to pose. Like a body builder pose. Like he’s on stage at the finals of Mr. Universe pose. I, of course, start laughing and tell him to ‘show me love’. He moves to the back of the spring and begins to now pose as if he’s in a 1950’s Hollywood movie. One leg out of the water. Floating on his stomach with his held tilted back out of the water. This guy is dead serious. I am mesmerized. I take a few photos which I knew would be blurry since I was shaking with laughter. Feeling his photo shoot is now complete, he says “Thank you” and begins to idly float. As Zach, Courtney and I turn to head back down the trail, I know that I have just witnessed greatness. Warm versus cold. Rushing versus still. Green versus clear. Batman versus Superman. You get what I’m going for here. I’m not sure where this man is from. He had a natural reddish glow about his skin and spoke broken English. He is my hero and I hope one day to be like him. To the southwest of Panther Junction, lies Chisos Basin and the jagged peaks of the Chisos Mountains, the southernmost range in the continental United States. As the road climbs through Green Gulch to the basin, vegetation changes from bushing creosote and grassland, to pine and finally juniper and oak. About five miles up the road hits its highest peak (5,770), before spiraling downward in a series of hairpin turns. Chisos Basin is a three-mile wide depression in the mountains, carved by wind and rain. Many of the park’s trail-heads lead from the basin and on this day I was heading to the Chisos Basin Loop Trail which connects Pinnacles and Laguna Meadow trails. Climbing steadily through the shade of Mexican pine, mountains surrounding the basin rise and spread out in front of you. As I walk along a well carved trail, I’m certain the vegetation rich arroyos are hiding mountain lions waiting for me to come whistling by. I can’t shake the feeling, courtesy of all the western novels laying around my house when I was a kid – my dad loved Zane Grey. And I think one of the Hardy Boy books actually had a mountain lion jumping down onto the boys on its cover! (Andy, remember when you, Obs and I volunteered to hike an extra five miles for provisions at Philmont? We walked though the narrow canyons and just knew a mountain lion was stalking us from above.) Since I’m writing this, plainly I was spared yet again. I was not pounced on by a large cat. I didn’t even see a tabby. But I had my head on a swivel the entire hike. I can say with complete certainty that there is a mountain lion in this photo. 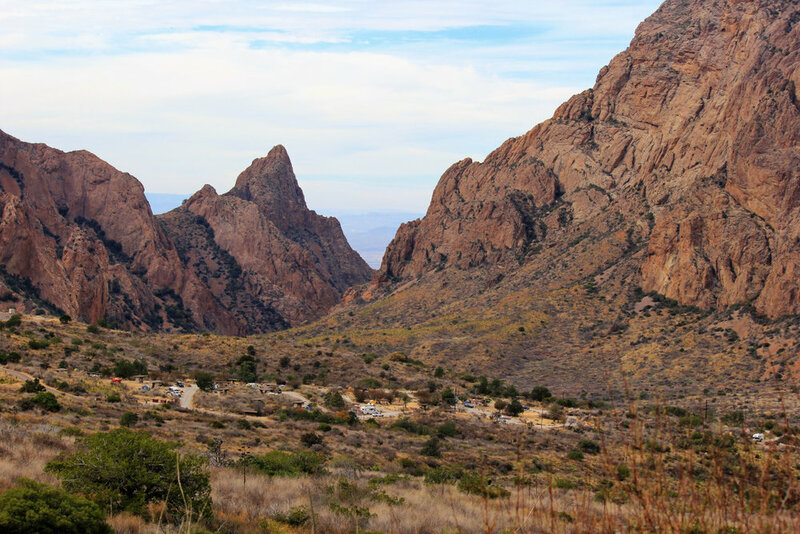 Ross Maxwell Scenic drive – looking at the western side of the Chisos Mountains. The drive south from Santa Elena Junction to Castolon Visitor Center is named after Ross Maxwell, the park’s first superintendent, from 1944 through 1952. This from NPS.gov – “When he arrived on the job in July 1945, he supervised four employees and had an annual operating budget of $15,000. At the time, the park had no paved roads, no electricity, and the nearest telephone was 100 miles away. While superintendent, Maxwell laid out the route of the road today named in his honor to highlight the more spectacular geologic features on the west side of the park.” As I drove his namesake road, I couldn’t help but reflect on what it took to develop these parks into the magnificent protected shrines they are today. Dedicated people like Maxwell are to be held in the highest esteem. Without them, their vision and dedication to a higher principal, we would be a far less wealthy people. Cottonwood Campground sits at 2,169 feet, a small, quiet, cottonwood shaded oasis. My home for a few nights while I explore the western edge of the park and Santa Elena Canyon. The narrow road to the canyon mirrors the Rio Grande for about eight miles before turning out to an overlook. From here you can see the canyon opening several miles further south. Even from this distance you can sense the grandeur of the canyon walls. A park ranger told me that if you were lucky and time it just right, you can see the sun hitting the far wall of the canyon as it lowers behind the walls. And just like that, I formulated a perfectly timed plan for the following afternoon. A bluff overlooking the Rio Grande with Santa Elena Canyon in the distance. I stood up here for about 30 minutes throwing rocks into the river. I also threw several across the river into Mexico. My arm is still impressive. NOTE: If this is illegal I will deny ever being in Texas. 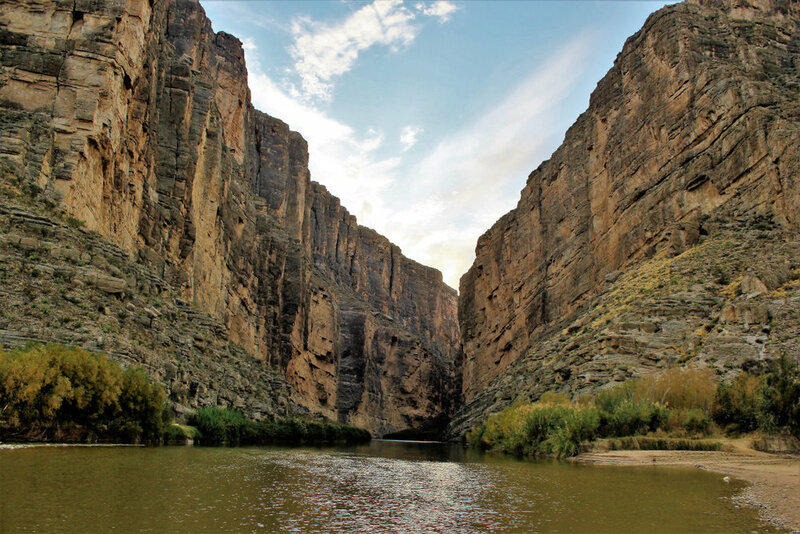 The mighty 1,500 foot walls of Santa Elena Canyon. The guidebook said to put on some old shoes to wade Terlingua Creek, before starting a hike into the canyon. I was in luck, because I only own old shoes. As it turns out, someone had built a small bridge of sticks across the shallow Terlingua, so I crossed in dry old shoes. To access the trail, you have to navigate a series of switchbacks that lead high above the river. By the time I reached the top and began hiking along the western wall, the sun was ducking behind billowing yellow clouds. There would be no display of the sun bouncing off canyon walls on this day. The best laid plans of mice and Smitty. The trail twists in and out of cream colored high grass, in places a few feet from the edge and a long – and in my case, high pitched scream – fall into the river. At one point I came to a large boulder in the middle of the path. Certain it was only there for those who stop at large objects, I walked around. The deeper into the canyon I walked, the darker it became – walls blocking the sun. Wind came into the canyon from the south. A warm gentle wind riding the length of the walls. Below the water moved languidly along its path, endlessly carving. Looking straight up, I could see the pin light of the night’s first stars. By the end of the trail it was difficult to see deeper into the canyon. As the walls curved away from the light, I turned and headed back to camp. Emerging from the canyon, the day’s final light reflected red off the river and onto the valley below. Sunset over a gap in the Chisos. A two foot high tunnel through bamboo grass, made by small animals to reach the river. Or the mountain lion that followed me the entire time I was in Big Bend. High cliff Indian pictographs on the trail to the hot springs. This one says Sitting Bear Was Here. My hero in the background after his photo shoot. In the photo I’m still laughing. As I write this I’m still laughing. 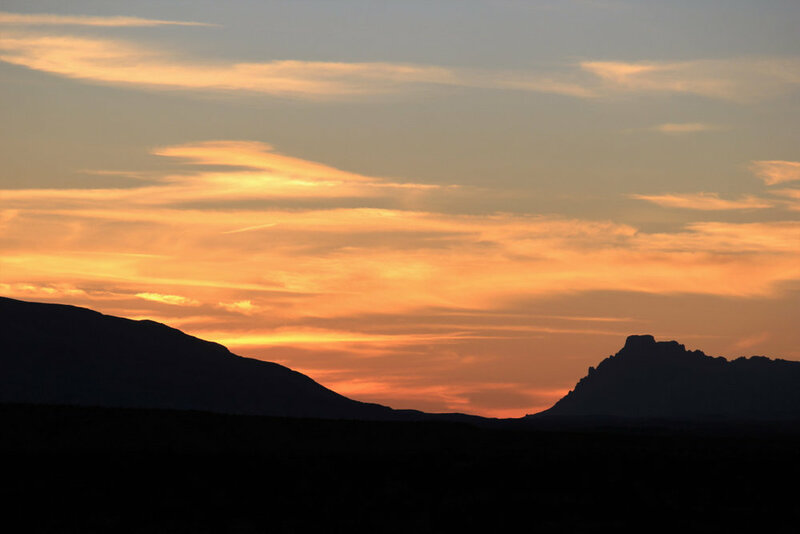 NOTE: For more information on Big Bend National Park and all the National Parks and to help with trip planning, download the free Chimani app to your smart phone to easily navigate your way around the park, with or without cell phone service.